By arrangement with the University of Michigan Press, open-access digital editions of the book are freely available on the Trinity College ePress platform at http://epress.trincoll.edu/webwriting. Readers may view the web edition online, or freely download the PDF, ePUB, and Kindle (Mobi) editions. The Trinity College ePress platform also offers an extra Tutorials section with how-to guides for several digital writing tools mentioned in the text. This platform relies on two open-source WordPress plugins—PressBooks (by Hugh McGuire at Book Oven, Inc.) and PressBooks Textbook (by Brad Payne at BCCampus)—on a web server at TrinfoCafe.org (maintained by Carlos Espinosa). 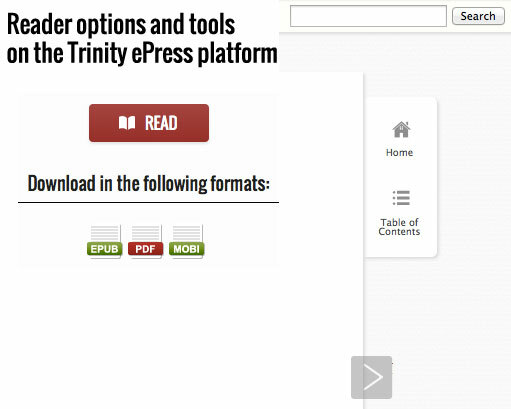 Reader options and tools on the Trinity ePress platform. 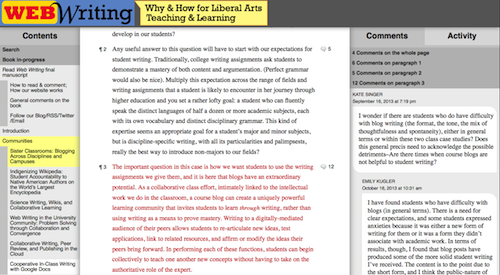 In addition, the 2013 open peer review edition of the book manuscript is freely available from Trinity College at http://webwriting2013.trincoll.edu. This edition includes the open call for essay ideas, preliminary drafts, and over one thousand comments by readers of the manuscript. It relies on another open-source WordPress plugin, CommentPress Core (by Christian Wach at the Institute for the Future of the Book). Click to explore the 2013 open peer review edition with over 1,000 reader comments. All web links to the final edition of this book were functional as of August 2014. Due to the changing nature of the Internet, all external links have been fully cited in the notes to assist readers of the print and digital editions. If a link is no longer active, search the web address using the “Way Back Machine” provided by the Internet Archive at https://archive.org/. About this book by Jack Dougherty, Tennyson O'Donnell, and contributors is licensed under a Creative Commons Attribution-NonCommercial-NoDerivatives 4.0 International License, except where otherwise noted.